During a talk at Georgetown University Law Center last week, Supreme Court Justice Ruth Bader Ginsburg spoke to the crowd about her experience as a woman in the profession. "In the ancient days when I was going to college, the law was not a welcoming profession for women," she declared. "In those days, in the Southern District, most judges wouldn't hire women. 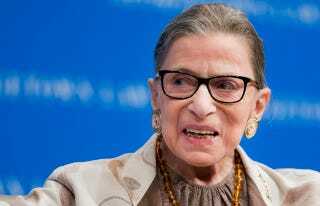 In the U.S. attorney's office, women were strictly forbidden in the Criminal Division," Ginsburg said. "And the excuse for not hiring women in the Criminal Division was they have to deal with all these tough types, and women aren't up to that. And I was amazed. I said, 'have you seen the lawyers at legal aid who are representing these tough types? They are women.'" On the subject of women on the Supreme Court, Ginsburg was unequivocal: "People ask me sometimes, 'When do you think it will be enough? When will there be enough women on the court?' And my answer is when there are nine." Notorious RBG, sometimes your words just hypnotize me.